SONAX Fallout Cleaner is an outstanding cleaner you should use to deep clean the exterior paint. One quick treatment can remove the vast majority of contaminants on your vehicle's exterior surfaces with little to no work. This helps ensure you have a clean surface, saving you so much time with a clay bar so you can get better results from your polish, sealant or wax. To use it, mist it on the paint, wait 5 minutes, rinse off/Wash off, it is that easy. Upon completion you'll be stunned at how much has been removed with so little effort. For heavier contamination you can agitate the surface with a clean sponge of microfiber towel before rinsing Fallout Cleaner away. This great product removes aggressive rust deposits and small rust spots from paintwork surfaces. It is suitable for removing industrial dust from paintwork and painted plastic surfaces and it cleans lime deposits, brake dust and other dirt from paintwork. Pick up the SONAX Fallout Cleaner and remove iron, brake dust, lime and other contamination quickly and easily! The Sonax Fallout Remover will be a great tool to add to your arsenal to help you start getting better results faster! It will cut down on the amount of claying necessary, which will save you time and effort. SONAX Fallout Cleaner removes aggressive iron contaminants and rust residue along with industrial dust from all paintwork and painted plastic surfaces. Especially gentle on materials due to its pH-neutral formula. Wash the vehicle. Turn spray nozzle to spray position. Spray undiluted SONAX Fallout Cleaner onto the areas to be treated. Depending on the extent of soiling let sit for 3-5 minutes out of direct sunlight. As the product reacts to the contaminants, you will notice the cleaner turning red/purple as it begins to breakdown the residue. Spray again and wipe over with a soft sponge. Afterwards, thoroughly rinse with clear water. Repeat treatment in case of stubborn or heavy residue. PLEASE NOTE: Do not apply in direct sunlight or onto hot surfaces. Do not allow to dry. Do not use on painted surface without clear coat (single stage paint). Protect against freezing. Very effective product. After a northeast winter of heavy salt, sand, rusty road metal, and pothole asphalt embedding into the clear coat of my truck, I decided to give Sonax Fallout Cleaner a try. I performed an initial wash with lubricating soap & microfiber mitt to remove any major contaminates, then applied Sonax one section at a time and allowed it to sit until color-change before rinsing off with water. I used a microfiber towel while the product sat to clean off any stubborn debris. After the water rinse, I followed up with a stronger, degreasing wash soap and microfiber mitt to be sure no Sonax residue or contaminates remained (it's smelly, so you can tell if it's still there). Altogether, the product worked very well; all contaminates and product residues were removed from the clear coat, leaving it ready for sealant application (my vehicle is white, so it is very easy to observe anything a product misses). I used almost an entire bottle because I have a truck that was heavily contaminated, but much less would be needed for a smaller vehicle or with less contamination. Using a microfiber towel in conjunction with the product to help remove stubborn contaminates is a great method, and you don't need much elbow-grease because the product does all the work. Normally I clay bar my vehicle after the grueling winter season, but the Sonax left the clear coat completely smooth and contaminate-free. The only drawback is the smell, but that helps you tell whether or not you've rinsed it all off the paint. 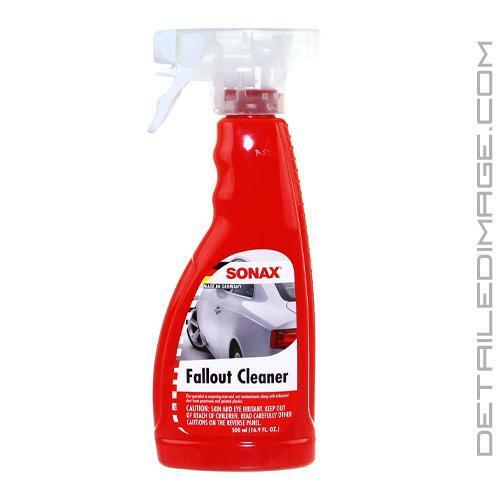 One of the best fallout cleaners around. This is a must have product if your lineup. Great product , will decontaminate your paint as well as your rims, takes our iron deposit and brake fist turn purple red, follow instructions. I usually wash car than spray this in body panels wait fir color change and than rinse off and then claybar to remove any embedded contaminant on paint surface. A must have to truly deep clean your cars paint finish and to remove grime and brake dust from rims !! !